From celebrity dogs to cooking demos, a Bear Grylls Adventure arena, and a huge array of the latest caravans, campervans and motorhomes – there’s something for everyone at the Caravan, Camping and Motorhome Show 2019. The start-of-the-season showcase kicks off during what is half term for many schools, running from February 19th to 24th, at the NEC in Birmingham, with plenty of activities to keep the kids entertained. Set over five halls, the show will welcome more than 90,000 visitors over six days and feature the largest display of caravans, campervans, motorhomes, static caravans, holiday lodges, tents, awnings and accessories, all under one roof. You’ll find our friendly team of caravan, campervan, trailer tent and motorhome insurance experts in hall one, stand 12-07, and this year we’re celebrating an amazing 20 years at the NEC! Show organisers have also announced the attendance of celebrity spaniels, Max and Paddy, and puppy Harry over the weekend of the show. 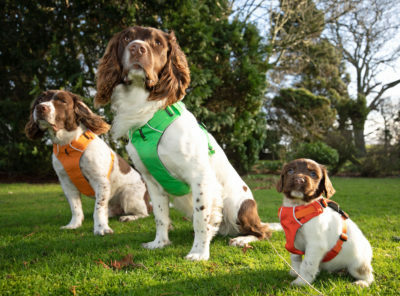 The four-legged adventurers helped their owner Kerry Irving recover physically and mentally from a car accident and have become an internet sensation with more than 73,000 followers on Facebook. They also recently won The Great Outdoors magazine Personality of the Year – Gold Award for inspiring thousands of outdoor enthusiasts! As well as being the perfect one-stop-shop to get everything you need for your next trip, there’s plenty of activities and guest appearances to keep everyone entertained at the show. Activities for the kids include the brand new Bear Grylls Adventure feature area, as well as the popular ice skating area and climbing wall – perfect for all budding adventurers! The Top Dog Arena will also show agility demonstrations and there are lots of events in the Discovery Theatre. Our fantastic “Wheel of Fortune” game is back – and all-new for this show we’ll have a limited edition prize to give away alongside our popular blue metallic bottle and first aid kit. This is to mark 20 years exhibiting at the NEC shows and will be available in 2019 only! 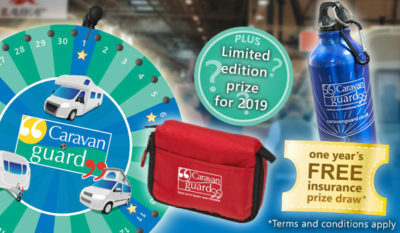 Everyone who spins our wheel will also be entered into a prize draw to win a year’s free caravan or motorhome insurance. Just drop on by to hall one, stand 12:07 to be in with a chance of winning! 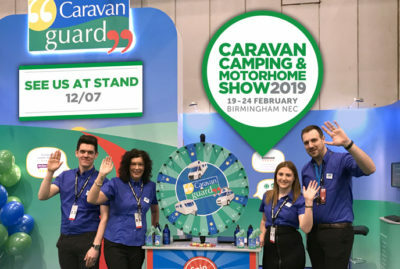 Tickets for the Caravan, Camping and Motorhome Show 2019 are on sale now and if you use our exclusive discount code – CGUARD – you can buy tickets from just £6.50** – saving £2.50 on the on-the-door price and 50p on the normal advanced price. To book tickets call 0844 873 7333 or visit www.ccmshow.co.uk using the code CGUARD. To find out more about the Caravan, Camping and Motorhome Show 2019, including the exhibitor list and activity schedule, visit www.ccmshow.co.uk. *20% touring caravan insurance discount includes 10% new policy discount plus Caravan Guard’s ‘club’ discount. Club discount can only be claimed once per policy term. 20% off and the £10 off motorhome insurance are available on new policies only and are not available in conjunction with other offers. Minimum premiums apply. **£6.50 Senior (over 60s), £7.50 Adult when booking before 23:59hrs 18/02/19, after which time prices revert to the on-the-door price of £9.00 Senior and £10.00 Adult. A £1.25 transaction fee applies. Calls cost 7p per minute plus your phone company’s access charge. Car parking is included in the ticket price. No dogs (except assistance dogs). Children 15 years and under go free when accompanied by a paying adult/senior. Tickets are non-refundable. Is there any chance you will have any discount for show in Glasgow SECC ? Sorry Iain we don’t as we don’t exhibit at that show.